Is Braun series seven the best electric shaver out there? We find out soon. It is another member of the Braun Series 7 electric shavers. 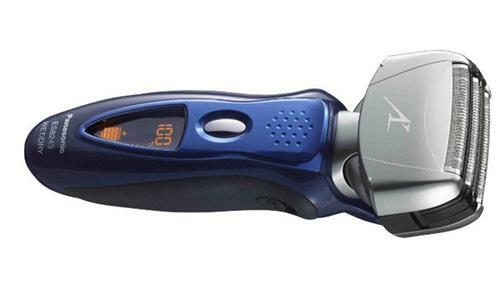 This shaver is the predecessor to the 799CC we review below. Until the 799CC was released, this was the favorite shaver among users. One of its major attractions was the three personalization settings modes. With this, users can set the shaver according to the sensitivity of their skin, normal speed or intensive speed modes. 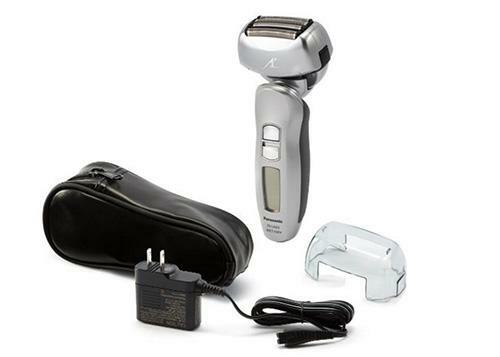 This model also has the intelligent sonic technology which gives you 10,000 micro vibrations per each stroke giving you a faster and closer shave. 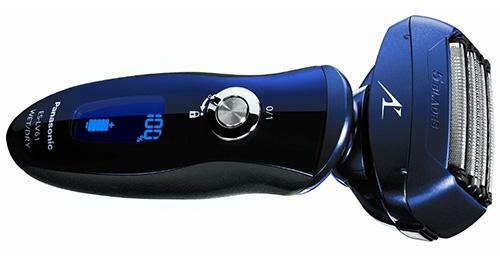 It has a 360-degree pivoting shaving head which enables you to get a close shave at every contour of your face and neck. The design feels very comfortable to hold and maneuver. 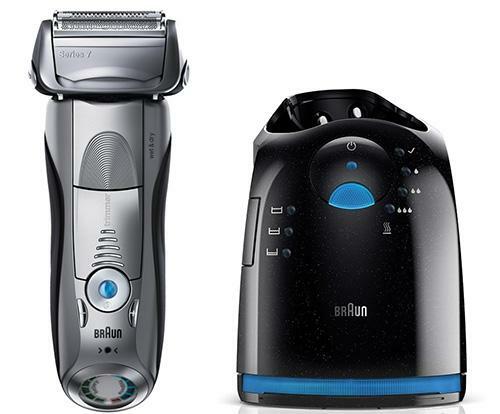 The Braun 790cc gives you a comfortable and close shave which is almost as close as a blade shave. Most users did not feel any irritations (even those with sensitive skins). If you do experience irritation the first few times of using it, don’t be alarmed as this is normal as your skin can take up to a month to adjust to the new shaving pattern. A few users were skeptical of switching from their current electric shavers to this one but, once they mastered the courage to change, they were amazed by the difference. The Braun Series 7 790-cc is a foil shaver and, therefore, very friendly with men who have sensitive skin. Most of the user reviews we have seen have been very positive, and this shaver is often the best choice for most people looking to switch to an electric shaver. An advanced cleaning & charging system that clean, charge, and lubricate the shaver to make it last for years. Although quieter than most electric shavers, some men will find this a bit noisy. Update: The Braun Series 7 790cc-4 reviewed above is not a wet/dry shaver. It is certified to be used for dry shaving only. If you are looking for a wet/dry capable shaver, then what you need is the Braun Series 7 799cc-6 which we review below. We were able to use the 790cc-4 in the shower, but because Braun has not approved it for wet shaving, you do so at own risk if you do decide to use it that way. If shaving in the shower is a requirement for you, then please get the 799cc-6 we review below. It is a bit more powerful than the 790cc-4. 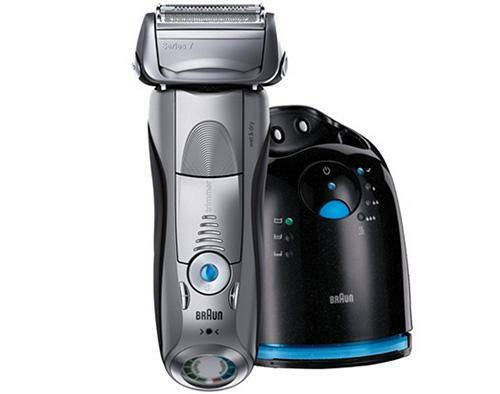 Note: A new version of this shaver is out called the Series 7 797cc-7. According to Braun, it is an improvement on the 799cc-6. We are yet to test this shaver but have only seen positive user reviews for it so far. Click here to read what real users are saying about it. Braun is a giant in the electric shavers market. It is, therefore, no surprise that you will find a couple of their products making the best electric shavers list for men. Most consumers that purchase this brand of shavers buy the Series 7 models. And the 799CC-6 is the latest model in their series 7 line of electric shavers. What most consumers seem to like about this shaver is that it is a wet & dry electric razor. It is 100% waterproof which means you can even use it in the shower if that floats your boat. It is also safe to use with shaving foam or gel. Just like the 790CC series, it comes with three personalization setting modes. According to Braun these settings are extra sensitive, intensive and normal modes. Each mode is designed to suit the different zones on your face and give you an adjustable shave that best fits the type of beard you have and your skin type. The Braun Series 7 is the only shaver from this brand that has these settings. Its smaller head (compared to other shavers) makes for easier maneuverability. It also means you can see more clearly where you are shaving. This is a foil shaver and therefore gives a more precise and closer shave. A significant improvement over the previous model is the fact that it can be used for a wet shave. Many users have reported smoother, more comfortable and closer shave with this shaver. It also has a very fast charging time compared to other shavers, which is a plus when you need to have in a hurry. This also means it has a longer shave on a single charge. It has an Activelift technology which grabs flat-lying hair and enables you to reach otherwise problem areas to give you a precise and smooth shave. The Braun Series 7 799cc-6 also comes with an intelligent sonic technology with 10,000 micro vibrations to give you a more thorough shave. This shaver also comes with an automatic cleaning charging system which has a much shorter cleaning cycle and has a silent drying cycle. It has an alcohol cleaning agent, which is perfect for sanitizing and cleaning. Almost all of the users that have purchased this shaver have high praise for it and have expressed complete satisfaction with their choice. You can click here to read actual reviews of the shaver by people who have bought this Braun electric shaver. It is also on the top list of Amazon’s best-selling electric shavers. Can only be operated cordless. You can use it when plugged in. This is, however, common to all wet shavers as a safety feature. To be fair, we’ve tried our best to find many cons with this shaver, and in all honesty, there doesn’t seem to be many. In order to simply search and identification of this product, it was renamed by Philips Norelco to Series 8000 Shaver 8800 so packaging may show either label even though it’s the same electric razor. 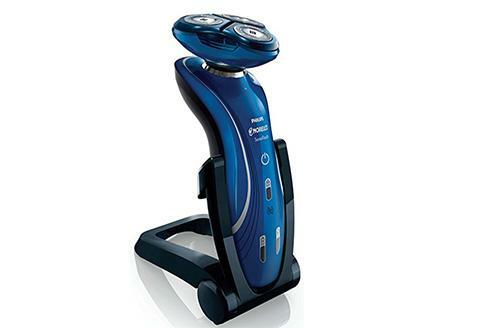 Series 8000 contains top shaving technology to make it a high ranking shaver for men. The Series 8000 contains a GyroFlex 3D system that allows its three combined heads to move independently, pivot, tilt, and flex so that every face contour is easily maneuvered. The surface of the shaving head contains technology dubbed SkinGlide which is low-friction and allows smooth gliding over the face, providing a close, clean shave supposedly without irritating the skin. However, some users express that irritation does occur in the first half a dozen shaves or so until the skin becomes accustomed to the razor. This could be due to not being used to the Lift and Cut feature which raises hairs before cutting them. The rotary blades need to be replaced every year or two depending on use and are rather expensive. The motor of the unit is both quiet and powerful and has no problem tackling thick, coarse hair quickly and efficiently. The Series 8000 does an excellent job at catching cut hairs which reduce sink mess. However, we recommended that you clean the head after each use, which is easily accomplished by simply flipping open the individual covers and rinsing the head under running water. Exposure to water does not present a problem as the Series 8000 is classified as a Wet/Dry unit which can be used effectively in either environment and even with shaving cream if preferred. There is a built-in trimmer for beards and mustaches which extend from the side and works quite well. This Philips Norelco razor contains a lithium ion battery that fully charges in an hour’s time and even provides enough charge after 5 minutes to a dead battery to complete a shave. An LED indicator screen on the razor shows how much charge time is remaining. One drawback is that the recharging stand easily slides about, so care must be taken especially around water sources. Also, the Series 8000 sometimes emits a high-pitched squeal while charging which can be annoying. This review provides an excellent rating for the Philips Norelco Series 8000 (1290X/46 Sensotouch 3D). The Philips Norelco 1150X/40 SensoTouch 2D Electric Razor (renamed as Series 6000 for added convenience) provides a clean, smooth shave for most men due to its curved shaving heads that easily maneuver the contours of the face. Typical difficult areas such as around the jaw line and beneath the chin are effortless to shave. The ranking of the 1150 is right up there with Norelco 3D products as it provides comparable performance at a much more affordable price with only a few minor setbacks. The Norelco 1150 relies on GyroFlex 2D technology which offers a shaving experience that is superior to other brands. The three heads contained on the shaver surface pivot separately for excellent facial coverage with little pressure or effort. The blade operates on a patented Lift and Cut system that provides clean hair follicle cuts below the surface of the skin with minimal irritation. The heads are also Dual Precision so that both longer hair and stubble fit into specially designed holes for an even better shave. The 1150 also has a SkinGlide surface that moves over the tenderest skin smoothly. Removed hair is collected in a special chamber that keeps shaving areas clean. For optimal performance, the heads should be cleaned after each use. One shortcoming of the 1150 2D is that it does not have flip-up covers for easy cleaning. To clean the 1150, you have to remove the head from the body. The trimmer attachment also requires that you manually removed the shaving head. Both of these maneuvers are a bit inconvenient, although they are accomplished without much effort. The Norelco Series 6000 is designed for both dry shaves and use in wet environments. Its Aquatec Technology is not only for in-water use but also with shaving foams and gels so that your skin remains treated as well as well shaved. The 1150 contains a lithium battery that charges rapidly and provides a long lasting charge. In our opinion, the 1150 is one of the best razors on the market, providing a great shave at a reasonable price. We hope this review of the Philips Norelco 1150X/40 SensoTouch 2D Electric Razor is helpful for making your decision. 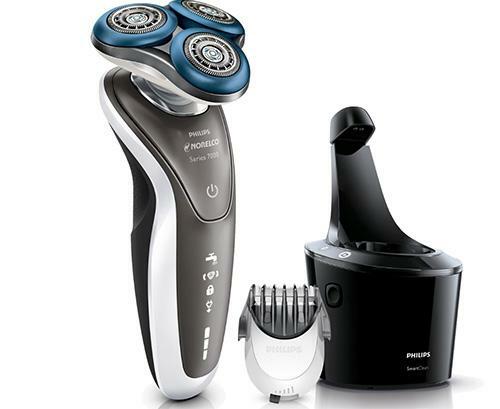 The Panasonic ES-LA63-S Arc4 Wet/Dry Electric Shaver for Men contains a fast and powerful linear motor that provides 14,000 cycles of revolution per minute. The foil head delivers a close, clean shave that is comparable to a straight razor and is comfortable even for those with sensitive skin. Some reviewers have even commented that ingrown hair problems disappeared after using this product. ES-LA63-S Arc4 performs well in both wet and dry shaving conditions. Because the unit is water resistant, it can be used in the shower as well as with creams and gels. The best shaves tend to be when the razor is used in wet settings compared to dry shaving. The wet feature also means the unit can be easily cleaned using running water. The Arc4 fits comfortably in the hand, and the rubberized grip located on the back side of the razor adds to its controllability, especially when used with wet hands. The Multi-Flex Pivoting Head moves back and forth as well as from side to side and follows facial contours well. The 4-blade shaving system holds an edge over many other razors that hold a high rating and only contain 2 or 3 blades. The pop-up trimmer also does a nice job. The battery can be fully charged in about an hour, holds a charge well and provides approximately 45 minutes of shaving time, although some reviews refute that length. You can also get a 5-minute quick charge when you need to shave in a pinch. The unit cannot be used while charging and the charger will not fit in the provided carrying pouch. The Panasonic Arc4 also contains a nice LED screen and a lock button to prevent accidental engagements during transport. Furthermore, the Panasonic Arc4 is quite affordable when compared to higher priced competitors that offer the same or similar performances making it a top ranked selection. According to this review, the Panasonic ES-LA63-S Arc4 Men’s Electric Shaver Wet/Dry with Multi-Flex Pivoting Head is one of the best values among similar razors. It provides a great shave and top performance in comparison with more expensive shavers. 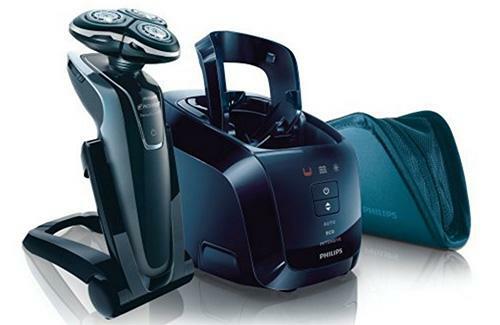 The Philips Norelco 1280X/47 SensoTouch 3D Electric Razor makes shaving a pleasure. This unit utilizes advanced shaving technology that provides superior performance without skin irritation. Norelco renamed this shaver to Series 8000, Shaver 8900 for customer convenience, but it is the same product. The reason for the close shaves received from the 8900 is due to its three-part GyroFlex 3D head system that tilts, pivots and flexes to easily meet the contours of the face. The UltraTrack heads also are larger than previous models covering 50 percent more surface and catching a greater amount of hair via its specially designed slots, channels, and holes. The Philips Norelco 8900 isn’t only a razor. It also can be used with the SensoTouch trimming head that adjusts to 5 different length settings so that men can also keep hair, sideburns, beard and mustache groomed. This model also comes with Aquatec for perfect shaves in both dry and wet settings. Whether you prefer shaving in the shower or using gels or foams, the 8900 meets the need exceptionally well. High ranking performance is supported by a lithium-ion battery that fully charges in around an hour and lasts for about an hour’s worth of shaving time. One of the best features of the Philips Norelco SensoTouch is its JetClean System that automatically cleans the unit while also drying, lubricating and charging it, all at the same time. Just place the shaver into the cleaning device and press the activation button. This superior system means you get a great shave time after time. The only real problem with the 8900 is that some users report that their unit creates a squeaking or clicking sound when the chrome case piece is depressed. Apparently, this is a small design flaw that only occurs on some of the razors. You should check this out immediately upon receiving your razor. If it makes the noise, simply report it, and the unit will be quickly replaced. This product comes with a money back guarantee within 45 days as well as a 2-year warranty on defects. Our review gives the Philips Norelco 1280X/47 SensoTouch 3D Electric Razor a top rating. According to this review, the Panasonic ES8243A Arc4 Electric Shaver for men is one of the best-rated razors on the market. Following are the reasons for the acclamation. The design of the Arc4 is ergonomically pleasing, fitting comfortably in the hand as well as being lightweight for fast, accurate maneuvering. The color design is also eye-catching being a dark blue with black sides that make the orange LED screen readout of remaining shaving time on the front stand out. This LED charge display is great for ensuring you have sufficient power to complete shaves, eliminating getting stuck mid-shave. However, it only shows up for a few seconds before shutting off. The internal lithium ion battery is top quality, fully charging in about an hour and providing sufficient power for around a half dozen shaves. If your LED readout shows you’re low on juice, no problem. You can get a quick charge to complete a shave in only 5 minutes. The powerful 13,000 CPM motor operates on a linear drive and produces enough torque to eliminate thick, coarse hair. The stainless steel arc foil has a semicircular design which allows circular motions and feeds hair into the 4 nano polished, 30 degree super sharp blades that produce an amazingly smooth shave free from redness, irritation, and cuts. The manufacturer recommends replacing the foil cover every year. The flexible head also pivots so that hard to shave areas are easily covered. The wet/dry feature is also incredibly convenient, allowing you to shave on the go, in the shower, or using your favorite creams and gels. The Vortex Hydra Cleaning System for the Arc4 frees up a lot of maintenance time. You only need place the razor in the dock and press a button for automatic cleaning, drying, lubricating and charging, all in one easy operation. 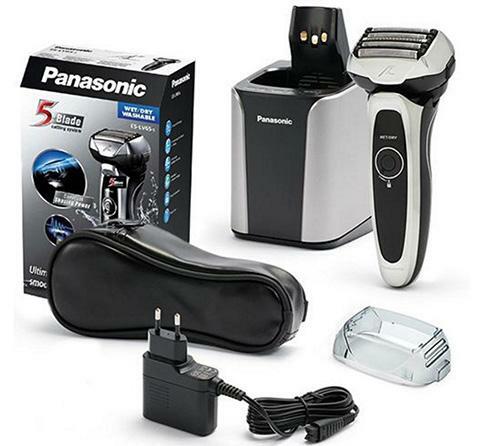 The Panasonic ES8243A Arc4 Electric Shaver for men is an impressive product that gets our highest ranking. 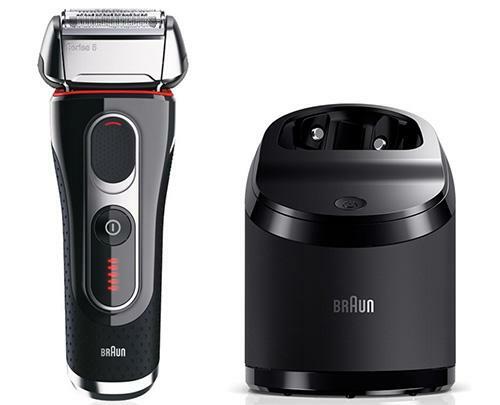 Update: There is a new version of the Braun Series 5 shaver model. The new model is the Braun Series 5 5090cc (pictured below) and we are working on a comprehensive review about it. Although we are yet to use this new shaver ourselves, we have read and heard a lot of nice things about it. You can check it out and read what buyers are saying about it by clicking on this link. For those seeking an improved wet/dry electric shaver that is more flexible and better at removing hairs, particularly in those hard to get at places like the jaw lines and chin, the Braun Series 5-550CC is the solution. The razor easily cuts both long and short facial hairs using its adaptive head as well as top technologies such as ActiveLift for raising and cutting hairs more closely and OptiFoil which better captures and cuts hairs. Triple action cutting from the three blades provides smooth shaves and prevents skin irritation under both wet and dry conditions. The downside in ranking for this model is that the shaving surface is narrower than many other models, so it takes longer to cover more facial area. The motor also isn’t that fast which slows the shaving process down even further. The 550CC gets a bit of a boost in rating due to the pop-out hair trimmer that nicely allows men to tidy up beards and mustaches. The unit is lightweight and fits in the hand nicely although some users claim it is too small. It also contains a handy LED display screen that shows both hygienic and charging status. Another top feature that makes the Braun Series 5-550CC popular with international shavers is the SmartPlug voltage adapter that converts between 100 volts and 240 volts. The razor is powered by a lithium battery which is completely charged in only an hour and provides a lengthy shaving time. Fast charges of only a few minutes provide enough power to complete a quick shave. The Braun Series 5-550CC also comes with an automatic charging station that also cleans, dries and lubricates the razor with the touch of a button. However, the cleaning station of this product is somewhat flimsy and tends to break easily. However, this is not too big of a problem since the 550CC is 100 percent waterproof, and can be easily cleaned under running water with the included brush. A travel case is also included in the set so that you can take your Braun Series 5-550CC with you on all your travels. This review provides the Braun Series 5-550CC Shaver System with a rank of 4 out of 5. Update: The Norelco 8000 series has been discontinued by Philips and replaced with the 7000 series. 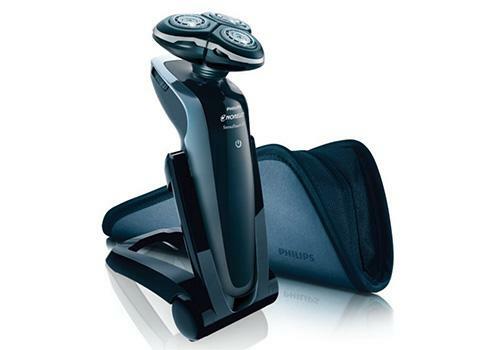 We are working on a comprehensive review of the Philips Norelco 7700 electric shaver which we will post soon. You can read more about it and check out what buyers are saying about the Norelco 7700 (pictured below) by visiting this link. The Philips Norelco 1250X contains a lot of nice touches making it one of the best electric razors for the money. The patented GyroFlex 3D shaving system provides a close shave due to its head consisting of three dynamic parts that tilt inwards, flex outwards and pivot around. All contours of the face are easily and gracefully maneuvered without the need for applying undue pressure for a nice, clean shave. The shaver head also receives all hair types via its UltraTrack system that contains channels for extra long hair follicles, slots for long hair follicles, and holes that accommodate remaining short stubble. The Lift&Cut system contains two blades that raise hairs from the skin allowing for deeper follicle reach. These combined features mean that you get a close shave faster, with fewer repeat passes and with less skin irritation. Because the 1250X is 100 percent waterproof, it can be used in the shower as well as with favorite gels and creams. The wet/dry feature also makes cleaning the heads a breeze. Its ergonomic design allows for optimal grip control and comfort. The 1250X also possesses a trimmer that pops out of the top of the razor so that men can also use it to sculpt sideburns, mustaches, and beards. A lithium battery powers the unit and provides a continuous run time of 50 minutes from a 1-hour charge. A 5-minute charge produces enough juice to complete a quick shave. A nice addition to the 1250X is the multi-informational LED screen that reveals how much charge remains, when blades require replacement, if the unit needs cleaning, and if the razor lock function is on. The razor lock is an especially high rated feature for those who travel as it prevents accidental activation of the unit. The set also comes with a protective cap, charging stand, cleaning brush, power cord and travel bag which elevates the convenience ranking even further. 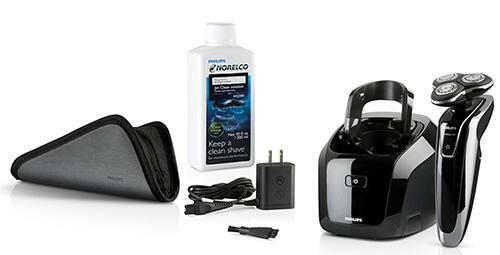 The Philips Norelco 1250X/47 SensoTouch 3D Electric Razor with Jet Clean System receives a top rating in this review. Update: The Panasonic Arc5 ES LV61 S is outdated and has been replaced by the new range of Panasonic Arc5 models. You can read our comprehensive review of the new Panasonic Arc5 ES-LV9N-S here (Arc5 ES-LV95-S pictured below). You can also click here to read what other users of the Arc5 are saying about it. The new Arc5 is one of our top 3 picks for the best electric shavers for men. If you’re looking for high-end performance from your shaver, then this Panasonic ES-LV61-A Arc5 Electric Shaver for men is like a top rated Rolls Royce. The sleek, modern design is pleasing to the eye as well as ergonomically comfortable in the hand. The rubberized handle increases comfort and provides extra grip when maneuvering. The wide shaving surface allows for greater area coverage and the Arc5 floating blade shaving system contained within provides an amazing shave that is both incredibly clean and smooth. The perfect shave is achieved by the Panasonic Arc5’s blades being nano polished to the ideal angle of 30 degrees as well as being hypo-allergenic to reduce skin irritation significantly. The Arc5 blades are also subjected to Lift & Cut and Vibrating Foil technology that eliminates all hairs at their lowest possible point. The Panasonic ES-LV61-A provides a magnificent shave on all areas of the face due to its MultiFlex head that pivots between 20 and 25 degrees in every direction. The jawline, chin, neck and other difficult areas are easily accessed and cleanly shaven. The entire process is driven by a powerful 14,000 RPM motor that eliminates all types of hair quickly and without tugging and pulling. Its Wet/Dry feature makes it a pleasure to use during dry conditions or while in the shower or with using gel or cream. The lithium battery fully charges in an hour and provides around 45 minutes of shaving time. An LED display screen provides a 10-stage monitoring of power level, and a pop-out trimmer offers grooming options. The Sonic Vibration Cleaning Mode makes cleaning the LV61 carefree. Apply a small amount of liquid soap to the cutting surface, submerge in water and activate. Sonic vibrations blow out all hairs and buildup in only a few seconds. The Panasonic ES-LV61-A is a perfect travel companion with its power lock button that prevents accidental engagements and its dual voltage operation that automatically detects and adjusts to either 100 volt or 240-volt outlets. The unit also comes with a zippered carry case, although it is made of cheap vinyl. You would expect more quality from one of the best shaver manufacturers in the industry. This review gives the Panasonic ES-LV61-A Arc5 a top ranking. Writing these reviews is expensive and time-consuming. We are committed to bringing you reviews that are not influenced by outside forces, so we do not take compensation or receive free products in exchange for writing our reviews. To finance our work and this website, we earn affiliate income on products bought through links in our reviews. This does not add any costs to items you buy through our links. If you decide to buy a product as a result of our research and work, we urge you to buy through the links we provide in the review. This ensures that we earn a small commission to help support this site. Affiliate relationships have no bearing on the products we test and the reviews we give them. You’ll notice that our referrals often lead to Amazon.com. This is because Amazon.com often have the best prices and an excellent customer service. You can take advantage of their free two-day shipping offer with Amazon Prime on any product you buy from them. They are our favorite online shop where you can buy almost anything for sale under the sun and feel safe doing so with the knowledge that you can always return what you don’t like. If you don’t have Amazon Prime, we urge you to try it today. Click here to read more about Amazon Prime and get a free 30-days trial. The free two-day shipping alone is worth it. If you have any questions regarding our ethics and how we review products, don’t hesitate to contact us.